Thanks to the surge of intense, back-to-basics programs like P90X, FOCUS T25, and INSANITY, people are realizing they don’t need expensive equipment to get a serious workout. 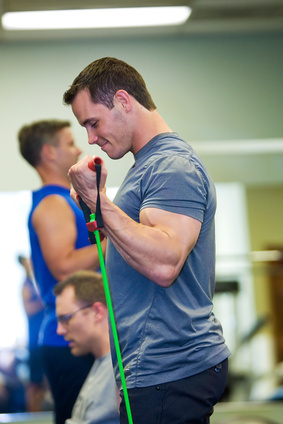 Resistance bands are amazingly versatile, no matter your level of fitness. You’ll never get bored of doing the same exercises as there are thousands to learn, try out, and include in your routine. Although there are many brands out there, most aren’t worth considering. We’ll be looking at the top-selling, most reviewed sets on Amazon.com. Offerings from Black Mountain Products, Bodylastics, and Tribe are reviewed here. Featured sets are similar according to specs, so differences in band and component quality are the focus of the analysis in full reviews below. All sets include five bands and may be considered entry level. 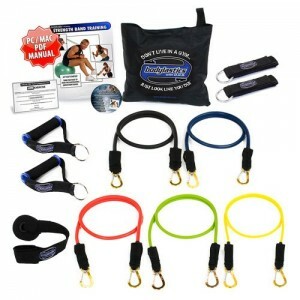 Bodylastics in particular offers more elaborate sets for bodybuilders, athletes and others with above average strength. 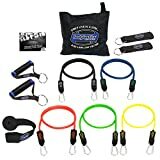 Note that if you’re interested in picking up individual resistance bands rather than a set, the SPRI Xertube series can’t be beat. As resistance bands can snap prematurely or after heavy use, warranty is a significant factor to consider when purchasing. Max. stackable resistance 96 lbs. 75 lbs. 105 lbs. Bodylastics is one of the best suppliers of resistance bands today if not the best. They offer sets in a wide variety of configurations from BASIC TENSION to the S.H.S. Mega Resistance System. We’re looking at their best-selling MAX TENSION set in order to accurately compare with competitors with similar offerings. Much like Black Mountain’s entry-level set, MAX TENSION includes five resistance bands, door anchor, 2 ankle straps, 2 thermoplastic rubber handles, carrying bag and user manual. To make their prices more competitive Bodylastics has dropped the inclusion of an exercise DVD, and 3 months of free access to a service called LIVEEXERCISE with over 2,000 live and on-demand workouts. These were marketing gimmicks as most people are looking to use these with a popular workout system such as P90X, P90X3 or FOCUS T25. Bands are dipped and estimated to be 99% snap resistant and failsafe by the company. Customer feedback indicates that the toughness of the bands is a modest step above Black Mountain. The MAX TENSION set holds up better with lower reports of snapping, and have superior TPR waffle grip handles. Bodylastics has the best reputation for honoring their warrantee among the three companies reviewed. Although the “lifetime warrantee” claim is a bit of a misnomer, they will replace bands and components for free within the first 90 days and for only $5.95 after (including shipping). This pushes Bodylastics to the top as the very best pick for the long haul. 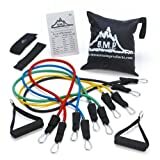 This is one of the top-selling resistance band sets on Amazon.com. Black Mountain claims its tubes are of surgical grade. Judging from popularity and positive customer feedback there does seem to be merit to this claim of high quality. There are less frequent complaints of snapping bands than budget-priced competitors such as Tribe. The set includes five resistance bands, door anchor, ankle strap, 2 cushioned foam handles, exercise chart and carrying bag. The lightest band is rated at 2-to-4 lbs. of resistance, while the heaviest is rated at 25-to-30 lbs. The bands can be stacked for additional resistance up to 75 lbs. Black Mountain has upgraded its limited 90-day warrantee to the same “lifetime warranty” their competitor Bodylastics boasts. Snapped bands are quickly replaced without much hassle, as Black Mountain has a reputation for good customer service. This set from Tribe is gaining in popularity due to the seemingly incredible value. It includes all the important items the others brands do for around $6 less. The kit features five resistance bands, door anchor, 2 ankle straps, 2 cushioned foam handles, and waterproof carrying bag. The specs on the bands are impressive too. The lightest band handles 5 lbs., while the heaviest facilitates 35 lbs. 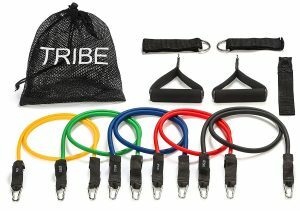 While this looks better than the other sets on paper, Tribe falls behind in terms of quality, and testing the limits of these bands isn’t recommended. Reports of snapping are prevalent among users but not bad enough to tarnish the set’s respectable 4 and ½ star rating. In a pinch these will do and they’ll get you by if you’re a light user. However people that pick this up to save a few bucks while aiming to use it regularly may find the savings dissipate in the long-term. The Tribe bands will need to be replaced before top-quality brands. There are no details of a warranty included in the package so if these snap you’re likely on your own. Bodylastics particularly is well worth the extra dough for the added security not to mention better quality tubes out of the box.